My hometown is Tiruchirapalli, a city in Tamil Nadu Prefecture in India, also called “Tiruchi” or “Trichy”. It’s the southernmost prefecture in India, and very close to Sri Lanka. My hometown is known for the snack named “murukku” and it’s one of the most important educational and religious centers in India. Here, in Japan, I can see that Buddhist temples and Shinto shrines are often nearby each other. But in most parts of India, you can’t see a Hindu temple, a Christian church, or a Muslim mosque nearby in the same locality. But, this is one of the most special things about my hometown - one can see these three religious places of worship in a single view. Apart from my hometown, I would like to say something about my prefecture Tamil Nadu. “Tamil” is the language which is spoken in the prefecture and “nadu” means country in our language, and thus the name “Tamil Nadu”. I am happy to say that of the few classical languages that are still spoken today, Tamil is one of the oldest. In our prefecture, we have our own style of cooking and taste for food. Although in recent years fast food culture has been developing in India, personally speaking a lot of Indians still really love South Indian food more than anything. We literally have 100s and 100s of curries but each one has its own taste. Even fast food items that are sold in India are adapted to suit our tastes. I have eaten at famous hamburger chains in both India and Japan, and I have noticed that the menu, and the spice ingredients that are added to each item, are different between the two countries. In India, the taste is spicier, whereas in Japan it’s not. Along with our sense and appreciation of spices in India, we also enjoy sweets such as “gulab jamun”, “rasgulla” and “laddu,” which are very popular throughout the nation. Apart from food culture, we enjoy a variety of entertainment such as movies. Because of our language differences almost every prefecture in India has its own movie industry. Thus one can actually learn different Indian languages just by watching the movies from that respective industry. Movies in India are known for song and dance. Why is there so much dancing in Indian movies? Because in India we like dance! Music and dance has been playing a huge part of our customs and culture from the ancient past, and I think that’s how music and dance became an important factor in our movies. In any Indian movie of any language there is often a lot of music and dance. It acts as a soul for Indian movies. I’ve also heard that people in India are good at mathematics. Sometimes it has been from natural talent. But nowadays, a lot of kids go to school centers where they learn how to use the abacus. So when one learns the abacus, even a third grade student, one can calculate great amounts just using this device. It’s about moving and counting the beads. If one is used to it, then even without using the board, one can learn to count huge amounts with his/her fingers. So, I think, that’s the actual truth behind the rumor that people in India are good at fast calculations. Maybe, I think, learning how to use the abacus at a young age is one of the biggest reasons why a lot of people in India continue to enjoy practicing mathematics as they grow older. I have also heard that India is full of tourist attractions! Yes, I’ve seen many Japanese people visiting India lately. They often visit Darjeeling. I would also recommend Delhi, which is our capital city, Agra—the place where Taj Mahal is located—and Jaipur, the pink city. And then in Amritsar they have the “Golden Temple.” The temple is made out of gold, and it is a sacred place for Sikhs. Also, there is Mumbai which is one of the biggest metropolitan cities, and the economic center of India. Even though there are so many other famous locations, these are the six common tourist attractions I would recommend in North India. South India is a place with spicy food. I would recommend Chennai (the capital of Tamil Nadu Prefecture), the city where I did my university education, and also it has so many tourist attractions most notably the “Marina Beach” which is the second longest beach in the world. Then of course, Tiruchi, which is also my hometown. And apart from that, Kerala; it is a very peaceful prefecture with so many beautiful sceneries as well as a town, like the Vatican, where you can travel by boat through canals. And then there is Bangalore (the capital of Karnataka Prefecture), which is the IT hub of India. And Hyderabad (the common capital of Andhra Pradesh and Telangana prefectures) is another big city in South India. 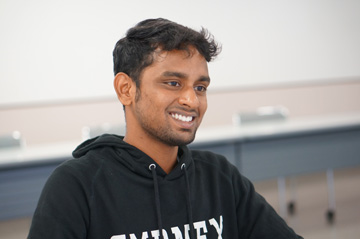 Mr. Dinesh, why did you decide to study in Japan? I wanted to go to a place where there is good education but at the same time has not been a popular destination for Indians, such as Europe or America. These are very common destinations for a mechanical engineer. However, I wanted to do something different. Except for the language barrier, I know Japan is as good as a place to study and have a career, as anywhere. Despite the language being difficult. I wanted to take this opportunity as a challenge and head to Japan. What kind of preparation did you do for the admission to Hiroshima University? I belong to a program called Global Manpower Development Project for Hiroshima Prefecture. I didn’t have any written entrance examination. My university in India and Hiroshima University have an MOU, a partnership agreement, so Hiroshima University wanted students from Asia. 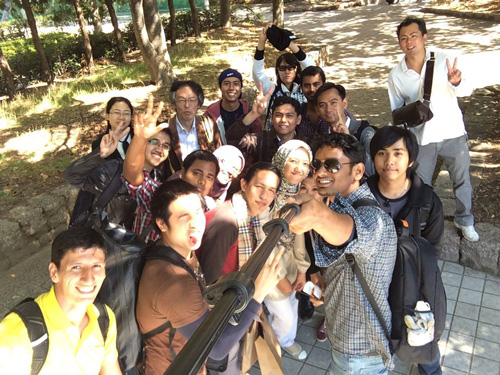 Every year, five students from Asia are selected, and they come to Hiroshima University to study for their masters in Engineering. I was really interested in this opportunity and I applied. The HU professor in charge of the program came to India to interview applicants, and after the interview the results were released and I was selected. What was your first impression of Hiroshima University when you arrived and saw the campus? It’s very peaceful, and there are so many trees. My university campus in India is just as big as Hiroshima University. Even though there are trees, the main part of my campus is just filled with building of various departments and it is crowded with people day in day out. But when I came here, I noticed that it was about the same size, but more trees than buildings (maybe because the campus has been well balanced with buildings spread evenly). It was also the season of momiji (maple leaves) when I came, so it was my first experience with such natural beauty; it was really peaceful, like heaven. There were all sorts of colors such as yellows, and maroons, and greens, and since I was seeing these for the first time in my life it was really an amazing welcome for me. Could you tell me about your major, mechanical systems engineering? My major back in India was manufacturing engineering. My studies in Hiroshima University are process based, so I don’t actually research to manufacture anything. We just do research on algorithms and how to manage stuff inside an industry. For example in simple terms, when input enters an industry, which machine it should go through first, and which it should go through second, and, for example, if these orders are changed, how efficient can the process become, and whether and how it leads to reduction of costs. Well, efficiency is very important for production, isn’t it? Yeah, very true, it’s the ultimate factor in the manufacturing sector of any industry. Mostly, my research is on production planning and job scheduling（inside an industry). Although I would like to explain more, it is quite difficult to understand. Thank you for your explanation. And now that you are studying at Hiroshima University, what is your impression of the lectures? They are really good. The professors here try to communicate a lot within the classroom, and they give the students their own freedom. Back in India, we have regular work to do inside of a lecture, and at the end of each lecture we have some time to ask questions and participate in problem solving sessions. But here the professors give us time to think about the lecture, and we write and submit reports later. Whereas back in India it was never this way; my grades were based on written exams. But here so far, all my grades are based on reports, which I think, motivates us to learn conceptually rather than memorizing a bunch of facts. I think that’s a really good thing about Hiroshima University. How do you evaluate Japanese students? I think they are fun loving but at the same time very punctual. Even for a party, for example, they are on time. That’s really impressive, because of course even in India we have various time obligations for jobs and stuff, but between friends we don’t follow time much. But here in Japan, even when meeting for no reason in particular, people are always on time. Two minutes is two minutes. Not more not less (laugh). As for learning attitudes, I’ve seen Japanese students do exceptionally well. But I feel in classrooms they are often shy. They don’t speak much. Even if they want to say something or ask a question, they wait till the end of the class for all the other students to leave, so that they can speak to the professor. I don’t know why. In India, this is not very commonly seen. If we want to ask something, we just ask what we want. But here I think students are very shy and not so participative in class discussions. Indeed. And you belong to International Student Association of Hiroshima University (HU-ISA). Tell me about the activities. It was started just one year ago to unite all the international students at Hiroshima University. There were already several international student associations such as the HU Korea Student Association and the HU China Student Friendship Meeting, etc., but in HU-ISA you are welcome to become a member as long as you are an international student at Hiroshima University. We have been organizing bus tours (one per semester) to foster communication between international and Japanese students, and we had a hanami (cherry blossom) viewing in March. And for the “yukata matsuri” festival we had a stall displaying the different cultures with traditional clothing and games of different countries around the world. 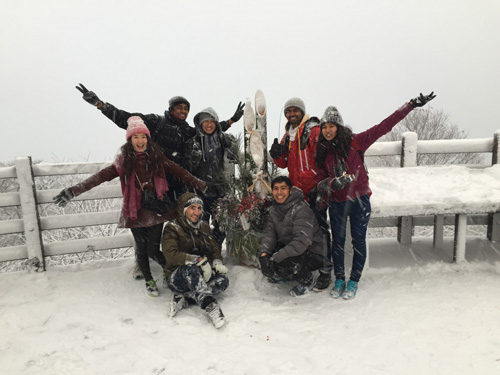 The main motto of this organization is to bind international students as a group and to create interaction between international students and Japanese students and societies. Last semester, I was the vice president, and this semester I have been appointed as the president of the organization. Did you experience any culture shock when you first arrived in Japan? Yes, a lot. For example, the anime culture is very huge here. I have seen even 40 or 50 year old people reading comics while on the train, but that’s not very common in India. At age fifteen or sixteen, if one is still watching cartoons, that person would be told that he/she is behaving like a child. But here everyone loves anime and is attracted to it no matter their age. Even my lab mates keep a comic collection in the lab. I was also surprised to hear about a few anime related circles which are existing in Hiroshima University. That was probably one of the most evident culture shocks I experienced when coming here. Have you experienced hot springs? Yes. That was another culture shock for me; hot springs. It was really weird to get undressed in front of others, because this is not something we do in India, and perhaps not in other countries either. So when I went for the first time, I was with a few other friends also visiting a hot spring for the first time, so all of us were feeling really shy about entering the hot spring undressed. But, for Japanese, this seems to be natural. Japanese often visit hot springs as a family outing. But for us the first time was a really weird experience. But from the next time onwards, however, it became more casual; we have come to realize that it is just a part of the customs and culture here. 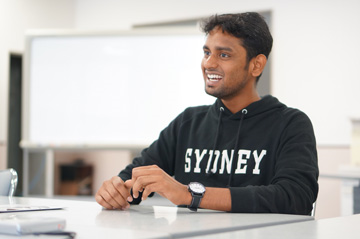 Mr. Dinesh, what kind of advice do you have for Japanese students who wish to study abroad in India? For Japanese people, I think it is most important that they can speak at least Basic English. India has so many languages, and it’s very common that people from one prefecture cannot understand the languages, of even their neighboring prefectures. But one good thing about us is, we are united by English throughout the country. So, if you can speak English, you can survive in any urban part of India, despite the various language differences. 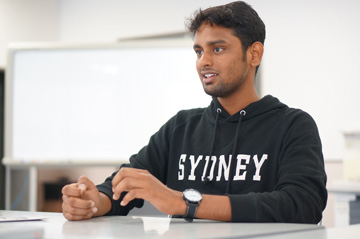 And in most of the institutions in India, the medium of instruction is English, so I think English is the most important factor for Japanese people who wish to study in India, or any nation abroad. As for technical knowledge and understanding, I think Japanese students whom I have met so far are just as good as Indians. How about their learning attitude? “Don’t be so shy”? Yeah. “To be more expressive”; to be more concerned about what they want to learn rather than being shy. As we discussed earlier, I think being more expressive is also important. Japanese are very shy when they want to express what they want, but in India it doesn’t work that way. In India, we love to meet new people, especially foreigners, so I think we are really inviting. Therefore one should be prepared to speak their thoughts without such restraint! 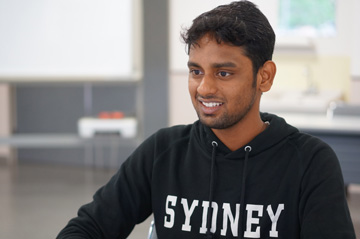 Do you have advice for students in India who wish to study in Japan? I think if someone from India can come here they can learn Japanese naturally. I feel Indian languages and Japanese are actually in some way interrelated. Maybe that’s why I was able to learn the basics of Japanese very quickly. 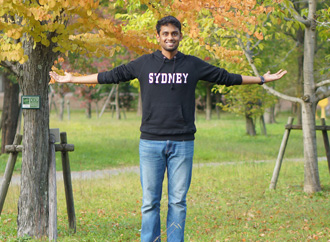 So I think Japan is actually a really good place for Indian people to study, but a lot of people are not aware of that. It is not a common location of study for Indians because they are afraid of the language. But there are a lot more positives than negatives here. Compared to the stories I hear from my friends studying in other countries, I think Japanese people are really kind and helpful. And the culture here is amazing!! Last question. Mr. Dinesh, What is your future dream? Someday I would like to see myself as the CEO of a manufacturing firm. Maybe my own company, or an established company. Since I have not yet worked in a company I have not thought much more beyond that. So maybe after three or four years’ time, I may develop a long term goal, like what to achieve after becoming a CEO. 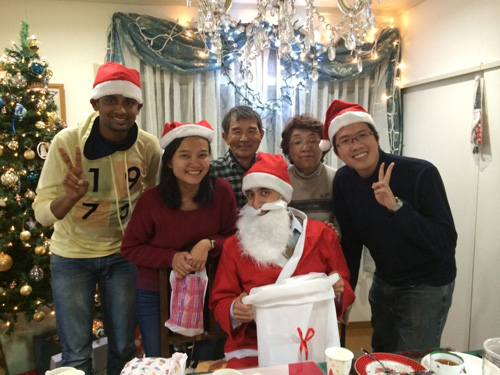 Special Christmas with my Japanese host family. I have a Palestinian brother (Santa Claus), Thai brother and an Indonesian sister. Trek to Mt.Ryuozan to see the first sunrise of 2015. We started climbing it from 4.00 am and were on the top at around 7.00 am on 1/1/2015. Teachers and classmates during my first 6 months Intensive Japanese language course. Had so many crazy outings with them. Divided by countries united by HiroDai. 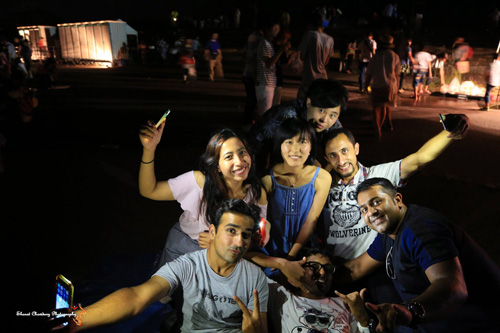 At Fukuyama hanabi, this was special because each of us in it is from a different country.